Breaking Glass, Making Glass | So Many Exciting and Beautiful Places! Almost the first thing I did today was break a beautiful glass jellyfish pendant that I had purchased at an art gallery in Destin. I really can’t be trusted around glass, but I love it so much!! Mark and I had relaxing massages this morning, then after lunch, went to the Chihuly Collection. It was simply amazing! We’ve seen his work in several places, including a traveling exhibit at the Scottsdale Botanical Gardens. This exhibit is in a much more contained space, which is equally impressive. Dale Chihuly studied glassblowing in Murano and was impressed with the way the various glass houses work in teams. As a result, his work is also done by teams. He develops, then sketches or paints the concept, and the team goes to work. His work is constantly evolving, as he comes up with new concepts. There are baskets, seaforms, chandeliers, floats, and many, many more. From there we walked to the Morean Glass Hot Shop to watch the process of glass making. On the way, Mark showed me a sign of his love. Glass blowing takes several steps to add color and shape the glass. Two artists worked together to create a beautiful lapis blue vase in about 10 minutes total time. Mark is interested in taking lessons to learn how to do this himself. This evening, we gathered with the bottlers group again for dinner. 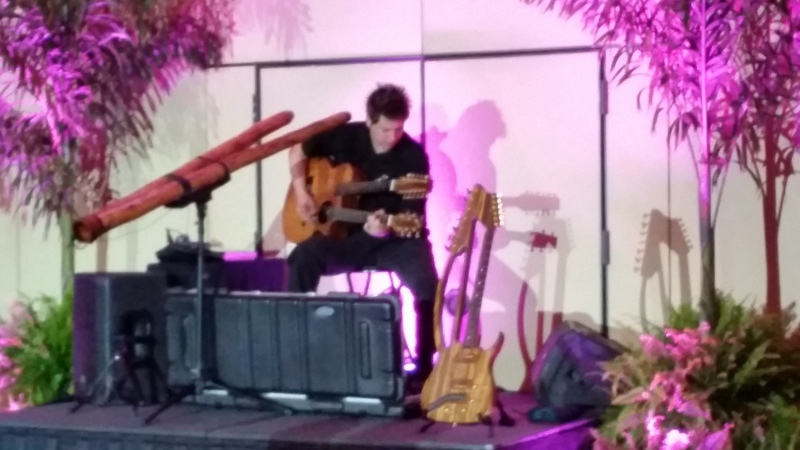 Entertainment was provided by a musician who played guitar and didgeridoo. Both of these instruments had been modified to allow him to switch between chords. The didgeridoo has two pipes fused together; the guitar has two fretboards. Double piped didgeridoo allows two different chords to be played. There were also bird puppets (hard to think of a better word) being guided by a master. The puppeteers were on stilts and made up to look like beautiful birds. The master was dressed like a middle eastern nomad. They interacted with the audience throughout the evening. We ended the evening with cocktails on the roof of The Birchwood Bar. 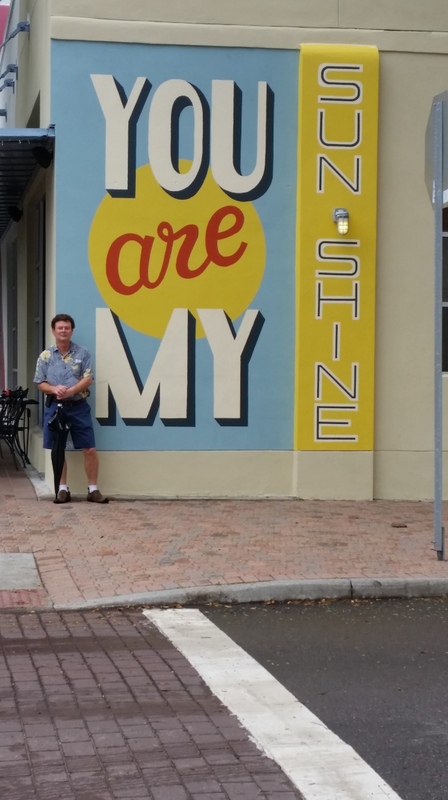 This entry was posted in Florida and tagged Dale Chihuly. Bookmark the permalink.